President of the Italy Sergio Mattarella has arrived to Armenia on a state visit. A meeting between the Presidents of Armenia and Italy took place at the Presidential Palace. Present at the meeting were the Ministers of Foreign Affairs of the two countries. Welcoming the President of Italy Sergio Mattarella, President Armen Sarkissian noted that his visit was a historic one since this was the first time President of Italy visits Armenia. Underscoring that the Armenian-Italian relations rest on the historical connections of the two ancient nations and common system of values, Armen Sarkissian said that in the quarter of a century since Armenia’s independence, the Armenian-Italian interstate relations have been developing in the atmosphere of partnership and mutual trust. 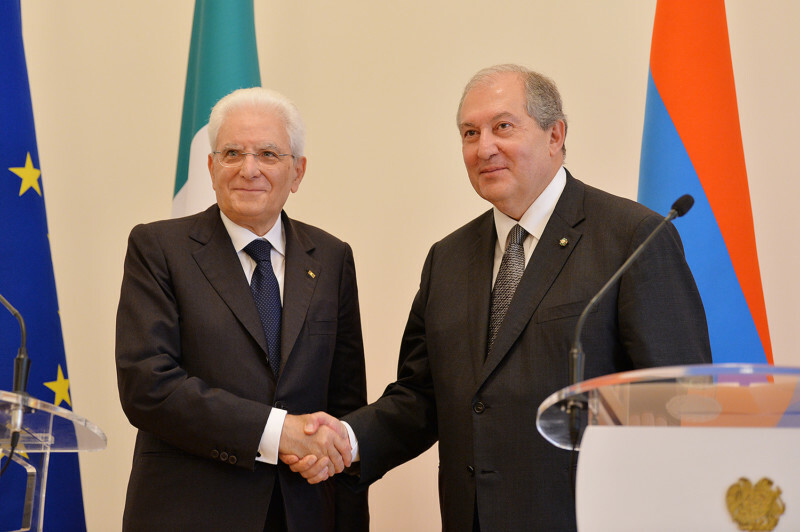 Presidents Armen Sarkissian and Sergio Mattarella exchanged views on the extensive agenda of the Armenian-Italian cooperation, noted that the multifaceted relations of the two countries hold great potential for development and through joint efforts might be elevated to a qualitatively new level. At the conclusion of the meeting, President Armen Sarkissian awarded the President of Italy with the Order of Glory for his considerable contribution to the strengthening and development of the interstate relations between the Republic of Armenia and the Italian Republic. “The conversation with President Mattarella was conducted in a warm atmosphere. We have had a substantial discussion over a wide range of the Armenian-Italian cooperation,” Armenian President Armen Sarkissian told reporters. “We have reiterated our commitment to strengthen the interstate relations. We have also agreed that extra efforts should be made to give an impetus to the Armenian-Italian cooperation in the bilateral format as well as at the international fora, including in the framework of Armenia-European Union partnership,” he said. “We have registered that Italy, as the country presiding at the OSCE this year, will continue to support the only international format for the resolution of the Nagorno Karabakh issue – the Co-Chairmanship of the OSCE Minsk Group. We have also spoken about the Armenia-EU partnership. This is another direction on which the Armenian-Italian relations have great potential for development. With this regard, we have expressed hope that Italy too, will ratify the Comprehensive and Enhanced Partnership Agreement soon,” President Sarkissian said. “In the framework of the sustainable development of the bilateral cooperation, we have also stressed the importance of a full use of the existing legal field which comprises over three dozen documents. We have noted the necessity of expanding and deepening the economic, business, cultural, scientific and educational ties and the importance of people-to-people contacts,” he added. “To underscore the importance of preservation of the cultural heritage, we will give a new impetus to our cooperation tomorrow when in Yerevan there will be opened the Armenian-Italian Center for the Preservation of Cultural Heritage. I am confident that the state visit of the Mr. President will create a solid base for the elevation of the Armenian-Italian political dialogue and multifaceted cooperation to a qualitatively new level,” President Sarkissian said.